The economy's on strike - but for how long? The government will soon report just how bad the economy was at the end of 2008. And there's a growing fear that the first quarter won't be much better. Do you expect to change jobs soon? Yes, I'm worried about layoffs. Yes, I'm hoping to move up. No, fingers crossed. I'm happy where I am. 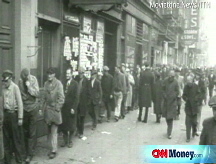 NEW YORK (CNNMoney.com) -- Everyone knows that the economy was in sad shape during the final three months of 2008. On Friday, we'll find out just how bad the fourth quarter was. That day, the Commerce Department will release its first reading on the nation's gross domestic product, the broadest look at economic activity, for the quarter. Economists predict that GDP plunged 5% from a year ago during the quarter, which would be the steepest drop since 1982. "The economy basically went on strike in the fourth quarter," said Joseph Carson, chief economist with AllianceBernstein. "It was a seizing up of activity across the board." But the fourth quarter is now in the past. What most economists, as well as businesses and consumers for that matter, are worried about is how long the economy will stay this bad. Unfortunately, there have been few signs of improvement so far this January. Weekly initial jobless claims soared 12% to a 26-year high in the most recent reading, and layoff announcements continue to pile up. Overall auto sales are forecast to fall to their lowest levels since 1982, according to General Motors (GM, Fortune 500). Excluding discount giant Wal-Mart Stores (WMT, Fortune 500), same-store sales for the rest of the retail industry are expected to drop 7% in January. January has also brought a string of unusually weak financial results. According to earnings tracker Thomson Reuters, earnings for the companies in the S&P 500 are forecast to decline 28% in the fourth quarter and 20% for the first quarter of this year. John Butters, director of U.S. earnings research for the firm, said profits aren't expected to improve until the end of the year, when comparisons to the weak fourth quarter of last year should help. What's particularly troublesome is that the earnings problems are not limited to the financial sector like they were throughout much of 2008. Excluding financial firms, fourth quarter profits are still forecast to fall 18% in the fourth quarter. "The weakness has spread across the economy," he said. Weak sales and earnings are not just bad news for investors either. As corporations continue to struggle, that will likely lead to more job losses ahead. And that will probably cause even sharper drops in consumer spending, which makes up nearly two-thirds of economic activity. Nearly 2.6 million jobs were lost in 2008, with many of those jobs coming from some of the hardest hit areas of the economy, such as banks, home builders, retailers and autos. But what's worrisome to economists is that many profitable companies that had been on a hiring binge until recently have announced sizable job cuts this month, such as Microsoft (MSFT, Fortune 500) and Boeing (BA, Fortune 500). "Demand is being destroyed. That's what's a recession does," said Lakshman Achuthan, managing director of the Economic Cycle Research. "Even if you're a healthy company and you have enough money to ride out of a depression, at some point it becomes prudent to let people go in this situation." Stimulus help on the way? The almost daily parade of job cut announcements will add to the urgency for the newly sworn in Obama administration and Congress to do something to try and stem the bleeding. Later this week, Congress is set to debate a more than $800 billion economic stimulus bill that would provide tax cuts, increased spending on infrastructure such as road construction, and help for cash-strapped state and local governments. President Obama has promised that this stimulus package could create or save millions of jobs. While many economists believe the economic stimulus package will help the struggling economy, few expect any impact before spring at the earliest. Most think there won't be a turnaround until the second half of the year, at best. Achuthan said the public reaction to the stimulus plan might be almost as important as the dollars it pumps into the economy. He said the plan needs to give both consumers and businesses confidence that the economy is poised to turn around. "Part of what drives the economic cycle is confidence and expectations," he said. "You can have the cost of capital low, the job market stabilize and some pent-up demand, but all those ingredients need some confidence to light the fire." Achuthan said he's still expecting the economic pain to worsen in the early part of 2009. Other economists are hopeful that the decline in GDP for the first quarter of this year will be smaller than the sharp plunge they forecast for the fourth quarter. And they're the optimists. Keith Hembre, chief economist of First American Funds, said he expects GDP to fall about 4% in the first quarter. Of course, that's little to cheer about -- especially since Hembre said that one reason growth may not fall as sharply in the first quarter is simply because some major sectors, such as construction and autos, can't sink much further. Plus, he doesn't think they'll bounce back anytime soon either. "Even if we stop declining, it'll be a considerable period before we see an upturn in that activity," he said.